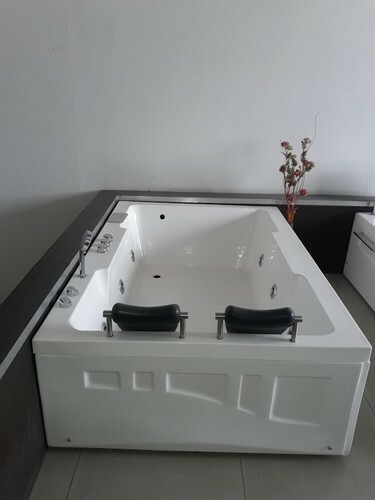 Our product range includes a wide range of Bath Tub 72" X 48", Bath Tub 6'X4', Bath Tub, Jacuzzi Bathtub, Massage Bath Tub and Round Bath Tub. 72" X 42" Acrylic Bath tub, Whirlpool pump 1.0 HP with 8 jets,Telephone shower, Tub filler, hot and cold mixing valve, Side panel,Front panel, under water LED light, SS stand, pop up waste. 72" X 48" Acrylic Bath tub, Whirlpool pump 1.5 HP with 8 jets,Telephone shower, Tub filler, hot and cold mixing valve, Side panel,Front panel, under water LED light, SS stand, pop up waste. 72" X 48" Acrylic Bath tub, Whirlpool pump 1.0 HP with 8 jets,Telephone shower, Tub filler, hot and cold mixing valve, Side panel,Front panel, under water LED light, SS stand, pop up waste. 72" X 36" Acrylic Bath tub, Whirlpool pump 1.0 HP with 8 jets,Telephone shower, Tub filler, hot and cold mixing valve, Side panel,Front panel, under water LED light, SS stand, pop up waste. 72" X 36" Acrylic Bath tub, Whirlpool pump 1.0 HP with 8 jets,Telephone shower, Tub filler, hot and cold mixing valve, Side panel,Front panel, under water LED light, SS stand, shampu stand, pop up waste. 60" Round Acrylic Bath tub, Whirlpool pump 1.0 HP with 8 jets,Telephone shower, Tub filler, hot and cold mixing valve, Side panel,Front panel, under water LED light, SS stand, pop up waste. 60" X 60" Acrylic Bath tub, Whirlpool pump 1.0 HP with 8 jets,Telephone shower, Tub filler, hot and cold mixing valve, Side panel,Front panel, under water LED light, SS stand, pop up waste. 48" X 48" Acrylic Bath tub, Whirlpool pump 1.0 HP with 8 jets,Telephone shower, Tub filler, hot and cold valve, Side panel,Front panel, under water LED light, SS stand, pop up waste. Shower Tray 39" X 39"
Bath Tub 5.5" X 2.5"